Acoustical foam provides the most cost-effective approach to controlling interfering reflections and noise. 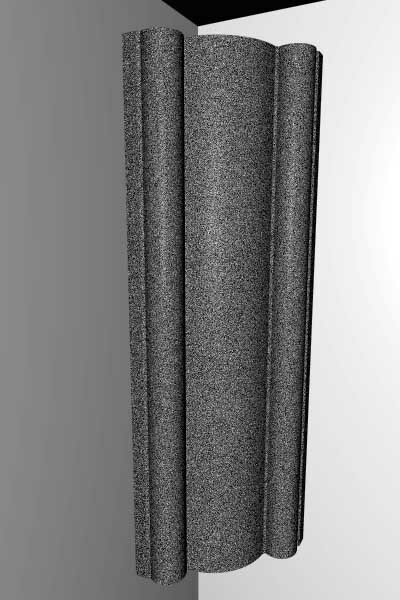 RPG® revolutionized the acoustic foam industry by introducing the first stackable foam with an innovative profile design. Now RPG® expands this concept by introducing ProCorner™: the first optimized corner mounted foam. By combining ProFoam™ and ProCorner™, a complete acoustical foam room treatment system is possible. In rooms in which acoustic foam is used as the primary surface treatment, a system that includes coordinated, attractive wall and corner panels is needed. The RPG® ProCorner™ complements the ProFoam™ nestable wall panels to create a complete acoustical foam room treatment. The ProCorner™ integrates seamlessly with the ProFoam™ wall panels and offers an NRC of 1 for exceptional broad-bandwidth absorption. The ProCorner™ offers ideal absorption across the audio spectrum in a convenient corner mounted panel. The graph indicates the random incidence absorption coefficient measured at Riverbank Labs.